One of the keys to unlocking the secrets of ancient Egyptian writing was the 'Rosetta Stone'. How big is the Rosetta Stone? 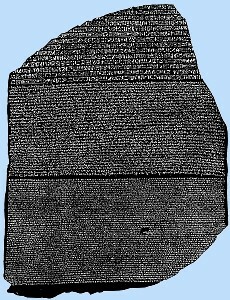 Why is it called the Rosetta Stone? What writing was on the Rosetta stone? The text is made up of three translations of a single passage, written in two Egyptian language scripts (hieroglyphic and Demotic), and in classical Greek. The Rosetta Stone is thought to have been written by a group of priests in Egypt to honour the Egyptian pharaoh. It lists all of the good things that the pharaoh has done for the priests and the people of Egypt. Why was there three lots of different writing on it? When it was written, there were three diffent types of writing being used in Egypt. Used by most people in Egypt at that time. When was the Rosetta Stone found? How long did it take to decode the Rosetta Stone? For twenty years scholars tried to decode the slab.